With the status of WWE's plans in the United Kingdom still undefined, Pete Dunne hasn't had a ton of opportunities to defend his UK Championship since winning it at TakeOver: Chicago. His first defenses came at NXT's house shows at Download Festival in June, then he defeated Trent Seven, Wolfgang, and BT Gunn to retain the title in ICW last Saturday. Next, he'll be putting it on the line when PROGRESS Wrestling comes to New York later this month. 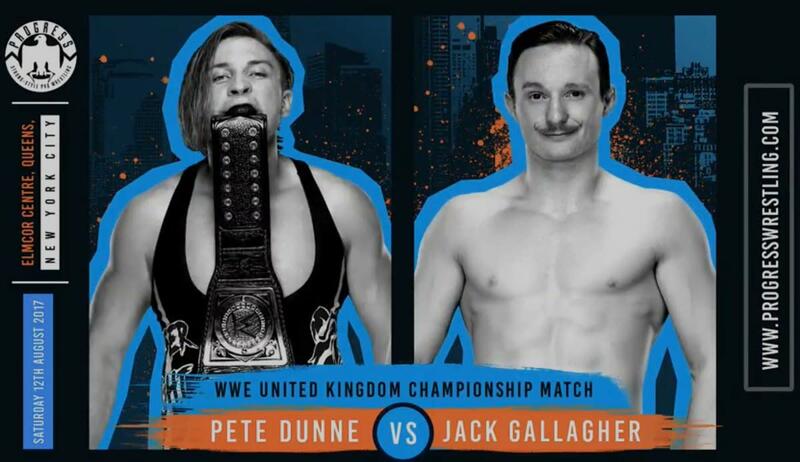 PROGRESS announced yesterday that Jack Gallagher would return to the promotion to challenge Dunne for the WWE UK title at their show in New York on August 12th. It will be the second time that the championship has been defended in PROGRESS, with Tyler Bate having previously retained against Mark Andrews over WrestleMania 33 weekend in Orlando. WWE also posted a story about the Dunne vs. Gallagher UK title match on their website. Like with the UK plans, WWE has yet to officially reveal any updates about PROGRESS and ICW events being shown on the Network, but Dunne's title defenses are proof that the relationship between the companies remains strong. PROGRESS NYC will take place at Elmcor Youth and Adult Activities in Corona, New York, which will also host an EVOLVE show earlier in the day. PROGRESS will then be in the Boston area for a doubleheader with Beyond Wrestling on August 13th.